Navigation: Home Dog Accessories Dog Leads Nylon Dog Leads Hem & Boo Nylon Dog Lead Black With Stars 48"
Hem & Boo Nylon Dog Lead Black With Stars 48"
Hem & Boo Nylon Dog Lead Black With Stars is from an exciting and funky new range from Hem & Boo. This stylish and bright dog lead is made of a soft nylon material and red webbing with black detailed ribbon stitched on one side. The ultra soft nylon is comfortable for your dog to wear yet strong and long lasting. These trendy leads comes with a zinc die cast trigger hook which is simple to release, extremely strong and long lasting. It also contains a wide hand loop for extra comfort. 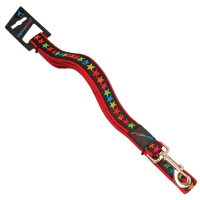 The multicolour stars and paws prints in red, green, blue, orange and yellow and pink make this lead suitable for boy girls and boys. Bought this to go with puppy's new red collar and am not disappointed, it looks and feels sturdy without being too bulky to hold.